In September 2018, Judy Russell, The Legal Genealogist, discovered that the website Manhattan Past was no longer accessible. The loss meant that a list of links to New York state session laws was in peril. Judy found part of the missing site on the Wayback Machine, a component of Internet Archive. However, a number of the archived links there do not work. I have intended to expand my online law library, and Judy’s post gave me the motivation to add links to New York’s laws to my site. Like any project, it took on a life of its own, and the end result was a much larger collection of New York session laws and other materials than that which was lost. 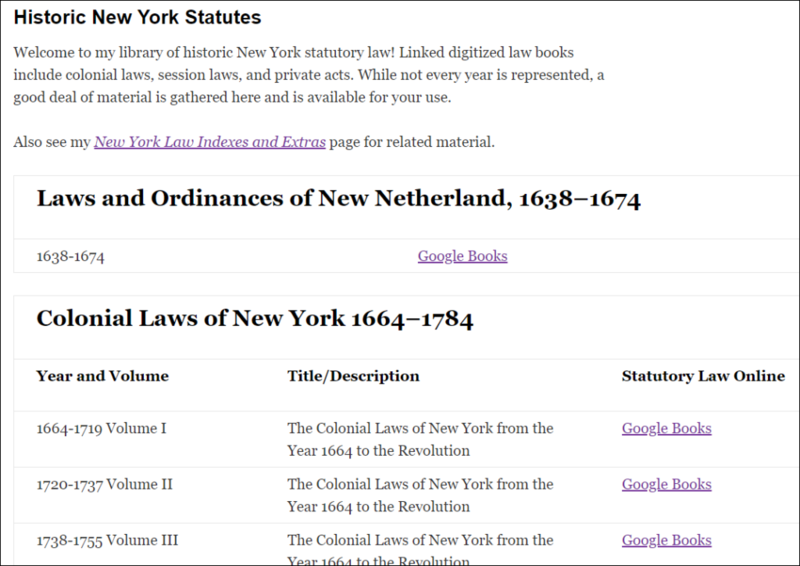 Welcome to my online New York law library, and be sure to check out the New York Law Index and Extras page, too. UPDATE 3.29.19: Also see my new Historic New York Case law page. A major thank you to Cyndi Ingle of Cyndi’s List, who helped design the page. This entry was posted in Law and tagged Law, New York. Bookmark the permalink. Thank you, thank you, thank you! Genealogiss, especially those of us with NY roots, are greatly appreciative. You’re welcome! I hope that you find it useful. Much appreciated!! I have late-New Amsterdam ancestors and then a group of New York state ancestors, so your work is very valuable indeed. I hope it helps you in your research! Many, many thanks! What a wonderful resource!